It is hoped that for firms with an interest in the water sector, the Water Campus will be a magnet for innovation and private-sector investment. 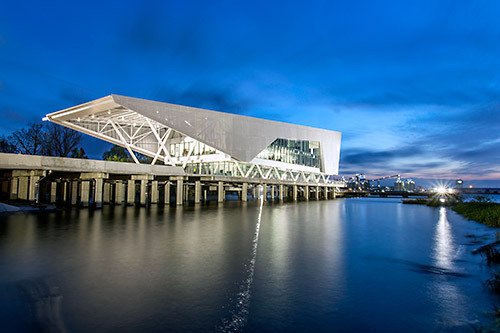 The award-winning Center for Coastal and Deltaic Solutions sits on the old municipal dock and houses the Water Institute of the Gulf. Editor’s Note: This article was developed in collaboration with Baton Rouge Area Chamber. The Water Campus, a world-class research center devoted to the study of coastal restoration and sustainability, opened in 2018 in Baton Rouge, Louisiana. When all phases of construction are complete, the 35-acre, $600-million campus will house more than 1.6 million square feet of collaborative research facilities and commercial space. Scientists here will study coastal threats and develop innovative solutions to protect these areas from the growing risks posed by climate change and rising sea levels. The concept for the project was developed by the Baton Rouge Area Foundation, in response to severe coastal land loss issues impacting Louisiana. Political, academic, and nonprofit leaders took several post-Katrina trips to the Netherlands to learn water-management best practices from the Dutch — some of the foremost experts in the field. The Louisiana team quickly realized that coastal and deltaic solutions were needed around the world. Seeing how a state-of-the-art research center could leverage the city’s deep knowledge and expertise in water management and generate international collaboration and acclaim, the foundation teamed up with congressional, state, and local officials to develop a plan for the campus. Developing over the next decade, The Water Campus will rise on 35 acres along the Mississippi, adjacent to downtown Baton Rouge. In that time, the number of researchers and support staff employed at the facility will expand to over 4,000. More than 1.8 million square feet of labs, research facilities and commercial space will enable them to carry out their vital work in a collaborative environment – studying coastal threats, formulating theories, exchanging ideas, and cooperating to arrive at innovative solutions that might never be possible working alone. After Hurricane Katrina, U.S. Senator Mary Landrieu (D-LA) asked the Baton Rouge Area Foundation to explore how Louisiana could rebuild its coastal areas in more resilient ways. This led to the idea of creating an independent science organization to lure the best coastal scientists to Baton Rouge. This resulted in the creation of The Water Institute of the Gulf to generate the science needed to support the state’s $50 billion coastal master plan. The state’s Coastal Protection and Restoration Authority moved its headquarters to the Water Campus. Enthusiastic, collaborative support was led by the Baton Rouge Area Foundation, several past governors of Louisiana, the City-Parish of East Baton Rouge, Louisiana State University, the Louisiana legislature, and various agencies for coastal protection and economic development. “The state, the city/parish, and the foundation acted as a private-public partnership, each contributing significant funding and talent to the project,” says John Davies, president and CEO of the Baton Rouge Area Foundation. When completed, the Water Campus will occupy 1.6 million square feet of collaborative research facilities and commercial space. One of the first buildings completed on The Water Campus was Louisiana State University’s Center for River Studies, a 50,000-square-foot indoor facility where LSU researchers and visiting scientists can model coastal restoration projects using a to-scale physical model of the Mississippi River the size of two basketball courts. 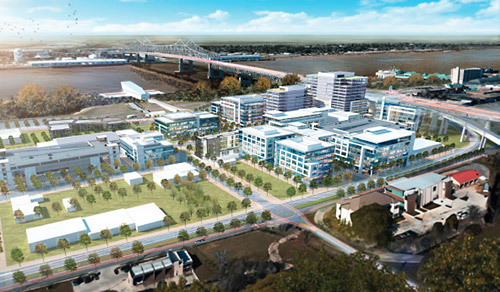 The Water Institute of the Gulf is another anchor tenant on campus, located immediately above the Mississippi River on a repurposed city dock. 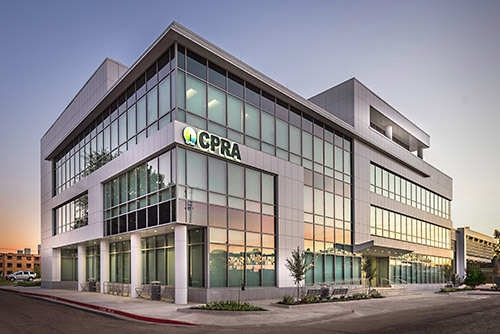 Nearby is Louisiana’s Coastal Protection and Restoration Authority (CPRA), which is responsible for the implementation of the state’s coastal master plan. Research conducted at The Water Campus will benefit climate change prevention strategies in the U.S. and around the world. With researchers from a dozen different countries — including Vietnam, the Netherlands, and several South American and Pacific nations — the Water Institute of the Gulf maintains a global perspective and plans to apply breakthroughs developed at the LSU Center for River Studies and The Water Campus to other global regions. 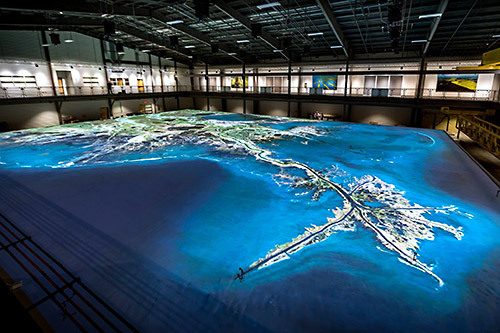 The to-scale model of the lower Mississippi River is housed in the LSU Center for River Studies at the Water Campus. A number of private firms are already set to move into an office building currently under construction on The Water Campus. Apartments will be constructed in 2020 to let people live just a short walk from their labs. When fully operational, the number of researchers and support staff at The Water Campus will exceed 4,000. The Baton Rouge Area Foundation estimates that the campus has the potential to create 10,000–20,000 direct jobs and 10,000–25,000 indirect jobs in Louisiana by 2030 and exceed $1.5 billion in capital investments.